Children welcome a visitor in the village of Garora, on the outskirts of Dehli. CNEWA’s president Msgr. John E. Kozar visited India recently. See more of his images and read his impressions here. Writer Jose Kavi chronicles the inspiring work of the Sisters of the Destitute in the Winter edition of ONE. Here, he describes one surprising aspect of the people they serve: their joy. The hamlet is part of Deendayalpuri, a resettlement enclave with more than 8,000 families, just 10 miles east of the Delhi-Uttar Pradesh border. What strike a visitor first are children and flies swarming the place. A child slept peacefully on a stringed cot outside a hut that sits the edge of a narrow lane with sewage water running on the sides. Flies buzzing around did not bother the baby, nor did the sniffing dogs. His mother was busy ticking lice with a group of women at one end of the lane while its father chatted with a bunch of men at the other end. Some other women in tattered saris and heads covered cooked on an earthen oven using dried cowdung cakes as fodder outside their tiny huts. Men played cards or watched games on cellphones in street corners. It presented a perfect picture of the life that India’s poor are destined to live. Despite its proximity to the national capital, no vestige of city life has touched the people, who eke out a living from a plethora of activities: dancing at weddings and other functions, begging at places of worship and prostitution. The enclave burst into shouts as soon as John Mathew, the photographer, Joshy Mon, a friend, and I entered the enclave with Sister Sumitha Puthenchakkalackal, a member of the Sisters of Destitute congregation. The nuns have been working in the area for more than 15 years. As soon as John Mathew took out his camera, children crowded around him and took over the direction. They insisted he take pictures of their friends and siblings. They needed no prompting to pose for photographs. They also insisted previewing the photos and approving them. Puddles of stagnant water on the tiny lanes and open drains that run along the lane gave out a foul smell. But hardly anyone seemed to bother about it. Filth and squalor have become part of their lives. Laughter of children and shouts of elders filled the air and elders and youngsters greeted us with folded hands. There were hardly any gloomy faces in those lanes. They have no social security, no healthcare schemes. But they lead what appears to be a perfect, blissful life. God has protected them so far — and they are certain he will continue to protect them and their children in future. Maybe they are, indeed, “Slumdog Millionaires” — with priceless riches we can’t see. Read more and discover why ‘My Great Hope is the Sisters’ in the Winter 2016 edition of ONE. Georgian children study English at a Caritas youth center in Tbilisi. 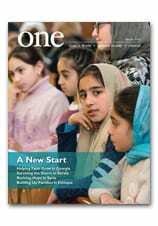 Read about one woman’s commitment to her people in A Letter from Georgia in the Winter 2016 edition of ONE. Bishop Declan Lang of Clifton, England, right, shakes hands with Palestinian Christian Daoud Nassar at the Tent of Nations 16 January in the West Bank, near Bethlehem. Some of the most dedicated people in CNEWA’s world are those who work with the handicapped — and one heroic figure we’ve come to know over the years is Sister Katharina Fuchs, of the Daughters of Charity. The children are some 60 severely mentally and physically handicapped boys and girls, aged from newborn to 16 years. The place is the Maison du Sacre Coeur — the House of the Sacred Heart — in the Israeli port city of Haifa. The care-givers are Sister Katharina, three other sisters, a number of local specialists and other staff. Sister Katharina is the Austrian-born superior of the House of the Sacred Heart, established by the Daughters of Charity, the religious community founded in France by St. Vincent de Paul. In addition to caring for the resident children, the sisters also maintain a day-care center with 240 children, assuring working mothers that their children are well cared for during the workday. This is a cherished Catholic institution that serves the needs of specially challenged children of all ages — even up to their early 20’s... I was particularly moved while watching the level of care with which some physical therapists worked, massaging the muscles of these special needs kids. Through a delicate series of respiratory heaves and hos, they were able to extract from them the desired cough that would help to clear their lungs. I asked one what this hard work meant to him, and his reply was: “I know each one of these children and their needs. I know when they are sick and when they are happy. I love them as I love my family.” I know where they get that loving family feeling — from the sisters. The sisters have also opened a kindergarten for almost 200 children. This has endeared the sisters ever more to the community, as they welcome children from Christian, Jewish and Muslim homes. Love is the common bond here and these youngsters have a real head start in learning how love can conquer many ills — even war and social injustices. To serve the poor, the sick, and vulnerable and those who need help in any way. The handicapped are on the top of this long list, nevertheless from whichever society, social background or political ideology they come from. Moreover, to work in the Holy Land gives us the opportunity to be in contact with all kinds of people living here. Jews, Muslims, Druze, Christians etc. can live and work together for the same goal: to provide good care and quality of life for all. Here, we can give testimony of the love of God for the poor, and to engage in interfaith dialogue. Middle East's Christians in 2017? A woman prays during Christmas Mass at a church in Bashiqa, Iraq. A wide variety of issues, both domestic and foreign, have been raised during the presidential transition. One that hasn’t received much notice is the situation of the beleaguered Christian community in the Middle East. Given the interest in, and media coverage of, those other issues, it’s an open question as to just what the United States would do for the Middle East’s Christian minorities under the presidential administration of Donald J. Trump. Rep. Chris Smith, R-New Jersey, said he would reintroduce a bill he first introduced in September that would ensure U.S. aid specifically reaches Christian refugees and internally displaced people in the region. Another feature would be to allow genocide victims — “at least the persecuted Christians,” Smith said — to apply as a family and get asylum in the United States. Smith said he gave a copy of the bill on 4 January to Vice President-elect Mike Pence. “I told him that everything in this bill you could do administratively,” he added. Stephen M. Colecchi, director of the Office of International Justice and Peace at the U.S. Conference of Catholic Bishops in Washington, was leaving for a mid-January fact-finding mission in the region, with the first stop being Erbil, Iraq, a Kurdish-controlled zone in the northern part of the country where many Iraqi Christians have fled. Two of Colecchi’s traveling companions will be Bishop Oscar Cantu of Las Cruces, New Mexico, chairman of the USCCB’s Committee on International Justice and Peace, and Bill O’Keefe, vice president for government relations and advocacy at Catholic Relief Services. “I imagine we will meet with a fair number of internally displaced Iraqi Christians. We will also be meeting with some Syrians who have fled to the Kurdish region because of the violence there,” Colecchi told Catholic News Service. Also on the itinerary are visits to CRS projects that assist all groups, including Yezidis and Shiite Muslims, “who have been affected by the terrible conflict,” he said. “There’s lots of confusion” when it comes to consensus on solutions, said Michael La Civita, communications director for the Catholic Near East Welfare Association, a Vatican agency. “No one knows what the future will hold,” La Civita added. “Should we have safe havens? Christians are saying no,” he said. “‘How can we be Christian witnesses to the Gospel if we live in the Christians-only zones?’ Others are calling for the swift emigration of Christians out of the Middle East. The Department of State’s declaration of the Islamic State’s murderous sprees since 2014 as genocide “allowed the international community to come full circle and really realize the gravity of the situation. Communities were being wiped off the face of the earth. They were going extinct, basically,” said Philippe Nassif, executive director of In Defense of Christians. Nassif said the fate of Christians will improve in some places, but likely not in others, citing “fundamentalism” in Egypt directed against the nation’s Coptic Christians. In Defense of Christians has the creation of a Christian autonomous region in the Ninevah Plain of Iraq as one of its legislative priorities. Another is to have Congress recognize the genocide with aid money to relieve its effect. A third is to support the security and stability of Lebanon, which Nassif noted has “the most populous and stable Christian population" and which could serve as a model for political cooperation between Christians and the majority Muslim populations elsewhere in the region. “To be honest, I find that politicians from both parties and the Congress seem to be very concerned about the crisis in the region,” Colecchi said. “I know there have been dramatic increases in U.S. assistance.” However, Smith complained to CNS about U.S. funds being sent to U.N. High Commissioner for Refugees camps, where very few Christians have gone. Colecchi added, “What I’m fearful of is that political commitment will come up against fiscal challenges. It’s in our best interest that the fabric of those communities be re-knit. It will be interesting to see. Most Americans, if you ask them, are quite supportive of federal aid, and they think it’s about 20 percent of the federal budget. When you ask them how much it should be, they think, not that much, about 10 percent. CNEWA’s La Civita is grateful for the more than $9 million generated from a special collection in fall 2014 to help Middle East Christians. CNEWA received 25 percent of that, and CRS the other 75 percent. But absent stability, cash infusions are not a cure-all.